Unit E-54 Bastion has recently arrived in Hellifyno thanks to the assistance of Joule Adams [SEE “friend file: joule adams”]. Though having extended time with Joule, Bastion still harbors a little fear of humans but his bonds to animals are still consistent. 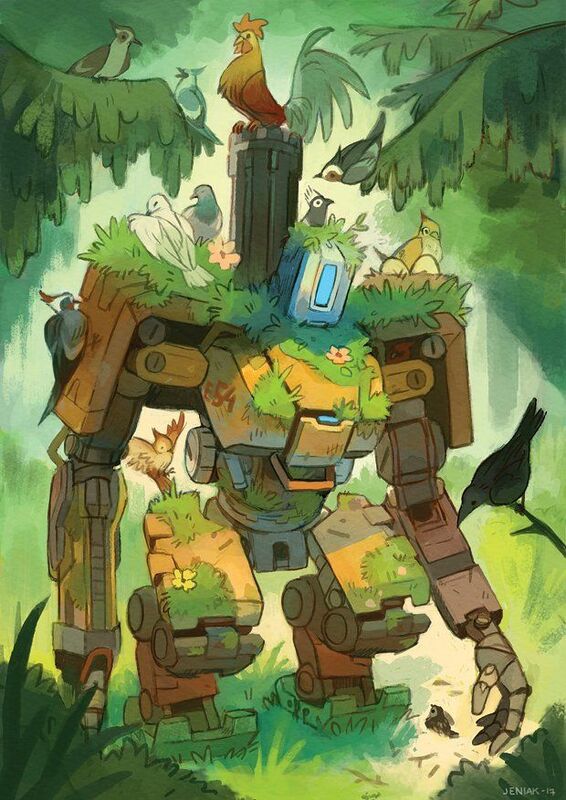 Bastion, along with his Avian friend Ganymede [SEE “file: ganymede”], mostly stays to the forests of Hellifyno in solitude, though sometimes Ganymede’s curiosity brings the omnic to the more populated locations of Hellifyno. Originally created for peacekeeping purposes, Bastion robot units possessed the unique ability to rapidly reconfigure themselves into an assault-cannon mode. But during the Omnic Crisis, they were turned against their human makers, forming the bulk of the omnics’ rebel army. Following the resolution of the crisis, nearly all of them were destroyed or disassembled. To this day, Bastion units still symbolize the horrors of the conflict. …its core combat programming takes over when the unit senses danger, utilizing its entire arsenal to eliminate anything it perceives as a threat. This has led to instances of conflict with the few humans it has encountered, and has driven it to avoid populated areas in favor of the wild, uncharted regions of the world.